If the model number GT-i9250 means nothing to you, you best brush up on your mobile news. It’s supposed to be the next Google phone, the Nexus Prime, and the first phone to run the much anticipated Ice Cream Sandwich. But the rumor mill has had its way with this one. We’ve heard juicy bits that seem entirely plausible and others that are downright false. 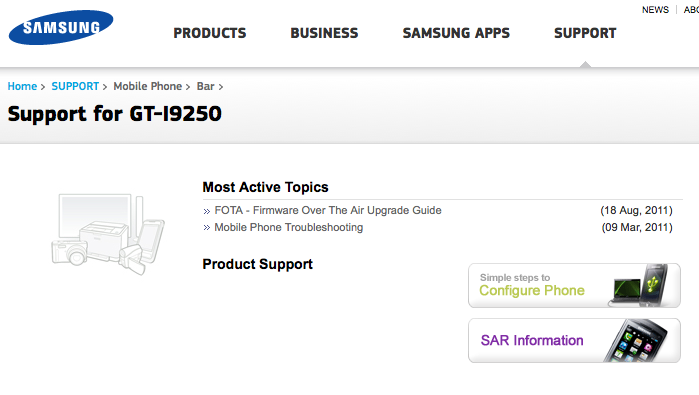 Today’s bit would be a dummy support page for the i9250 as shared by an unidentified GSM Arena tipster. The page itself is pretty barren, with a couple How-to and FAQ links that don’t even belong to the Prime. But the tipster seemed to know quite a bit about the phone, including information that squashes earlier rumors. This is where we get out our salt-shakers and proceed with caution. The first thing we need to know is that that leaked user agent profile that everyone believed to be for the Prime was actually the UAP for the Nexus S. That’s not to say that the Prime doesn’t exist or anything drastic like that, but more likely that they’re using the Nexus S Profile as a placeholder for the Prime. That said, the tipster claimed that “Nexus Prime” is merely a codename, and that the official Google phone moniker for this model will be the Samsung Galaxy Prime. When that User Agent Profile leaked, the first thing everyone made a huff about was the 800×480 screen resolution. No worries guys. First of all, the flagship Ice Cream Sandwich handset will most certainly have a more impressive resolution than phones that have been launched over the last two years. But past that, GSM Arena‘s tipster also mentions that the Prime will sport a 4.65-inch Super AMOLED HD display, which could mean that we’ll see the same resolution as we do on the Galaxy Note: 1280×800. The tipster also mentioned that the Prime will take on the same contoured display as the Nexus S, and have a waist line of just 8.8mm. Oddly enough, the source said that Samsung has opted for an entirely metal chassis on this little guy, which is quite the deviation from its usual plastic casing. We’re not sure how much that’ll affect the weight, but it could be a nice step up if they can keep it light. Finally, the tipster expects a launch around the end of October. This matches up nicely with Eric Schmidt’s promise of an October/November time frame for Ice Cream Sandwich, which could very well be the best part of the Prime. Drool on, fellow phone geeks. Drool on.